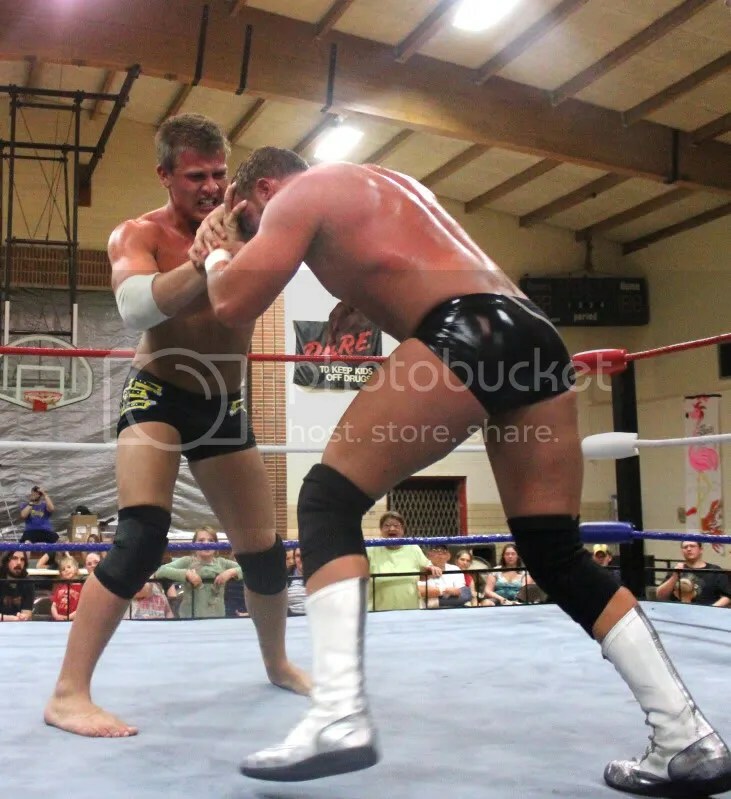 Chris Hargas and Flash Flanagan struggle for the upper hand early on in the match in East Carondelet, Illinois. Next weekend July 20th Midgets and much more in action! 7/20/2013 SICW East Carondelet Illinois 823 State St East Carondelet. Il 62240 –$9 Doors at 7 PM; Bell Time at 8 PM with MIDGETS in action. Marshall and Ross Von Erich wisely seek out the wrestling edge from Pro Wrestling Noah and WLW. See them this weekend in Warrensburg and Eldon, Missouri. In the 80’s wrestling was on fire, and there were no wrestlers that were more loved than the Fritz Von Erich’s sons, Kerry, Kevin, David, Mike and Chris Von Erich. Though their home was the Texas promotion World Class Championship Wrestling, fans across the country and around the world fell in love with the Von Erich’s. Fans cheered , shouted and cried at times as they took on such villains as the Freebirds, “Gentleman” Chris Adams, “Gorgeous” Gino Hernandez, One Man Gang as well as having wrestling the great manager Gary Hart trying to take down the Von Erichs. One of the greatest moments in wrestling history was on May 6, 1984, when Kerry Von Erich defeated “Nature Boy” Ric Flair in a historic match, in front of over 45,000 fans at Texas Stadium to win the NWA World Heavyweight Championship. 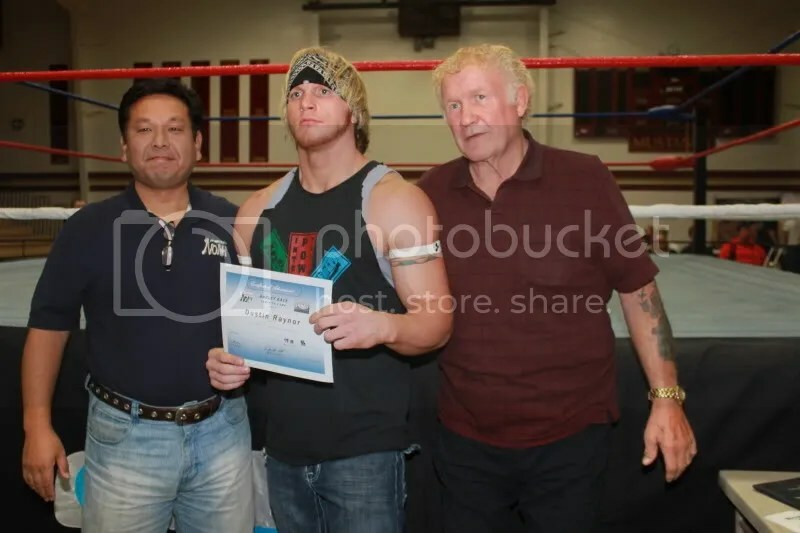 Kerry’s victory was a tribute to his brother David, who had died three months earlier and for whom the event, the David Von Erich Memorial Parade of Champions, was named. 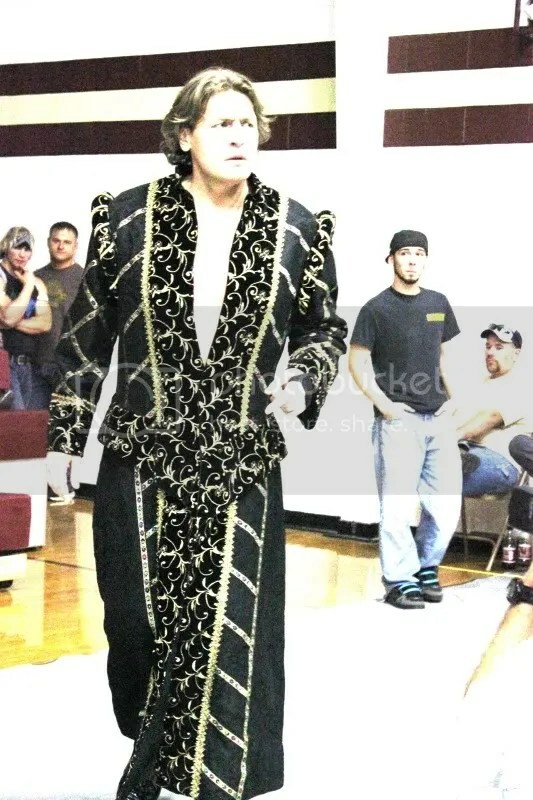 In their prime the Von Erich’s were the Beatles, Elvis and Jim Hendrix combined. Loved not only in the states but their impact on wrestling in Japan is still felt today. 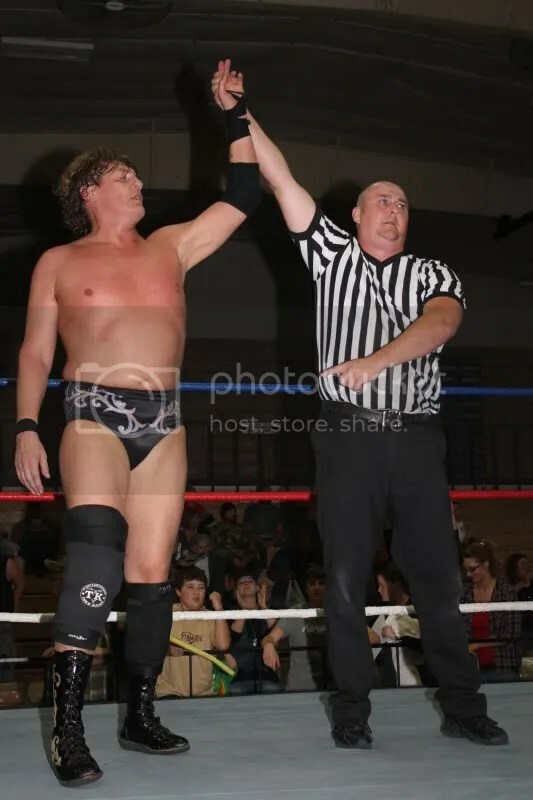 Last fall, the fans around the Midwest were thrilled when Harley Race announced that participating during the annual WLW, WWE and Japans Pro Wrestling NOAH was the recent inductee in the WWE Hall of Fame Kevin Von Erich would be appearing. During the week of the camp MWR was a guest of WLW and Pro Wrestling NOAH as Kevin along with WWE’S Steven Regal and Ricky Steamboat. The three stars along with Race taught the young wrestlers around the country who were fortunate to take the week long camp to learn with three of the top wrestling promotions around the world. 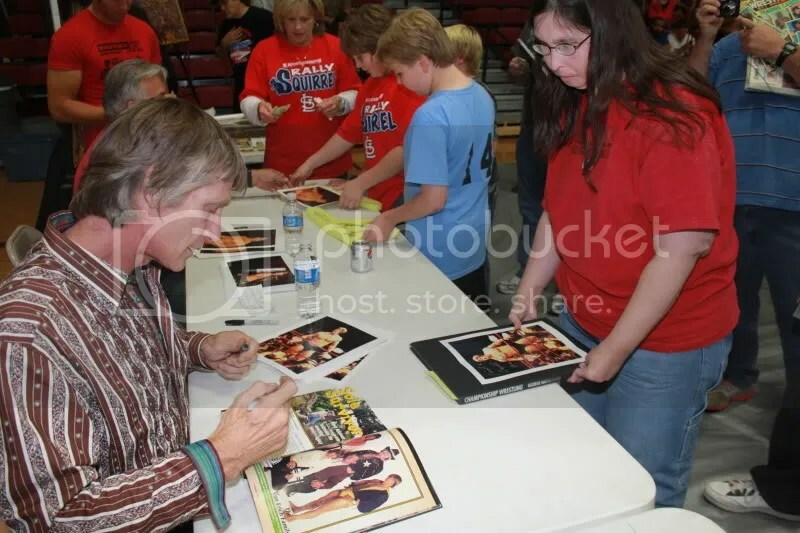 During the annual camp show, the fans came up to MWR with smiles that would remind you of a young child at Christmas time as they spoke about the kindness of one Kevin Von Erich. Sometime you meet your heroes that you grow up with and they live up to your expectations. 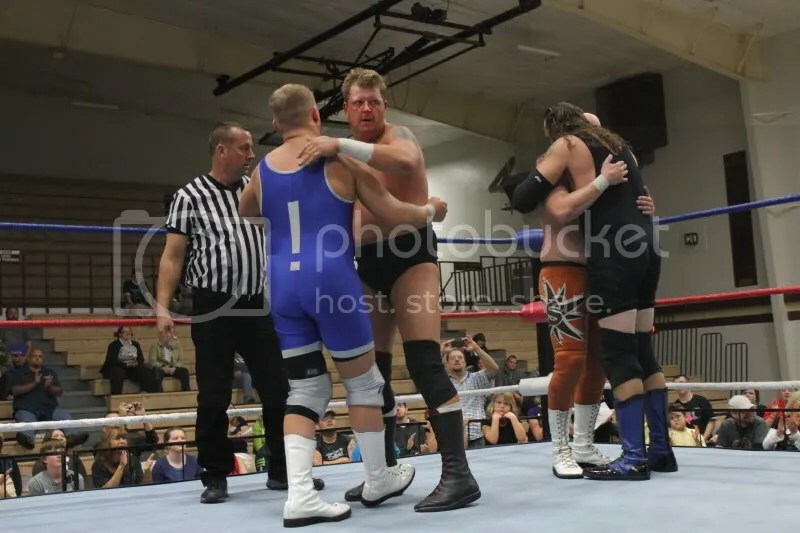 It was an easy recap to do when so many fans left happy meeting Kevin, Harley, Steamboat and being entertained by the stars of WLW with a stacked card that featured a main event match between Steven Regal vs. Ace Steel. For a look at that historic week of WLW/WWE/Pro Wrestling Noah presented a magical week for wrestlers and fans in the Midwest in October. Click here . 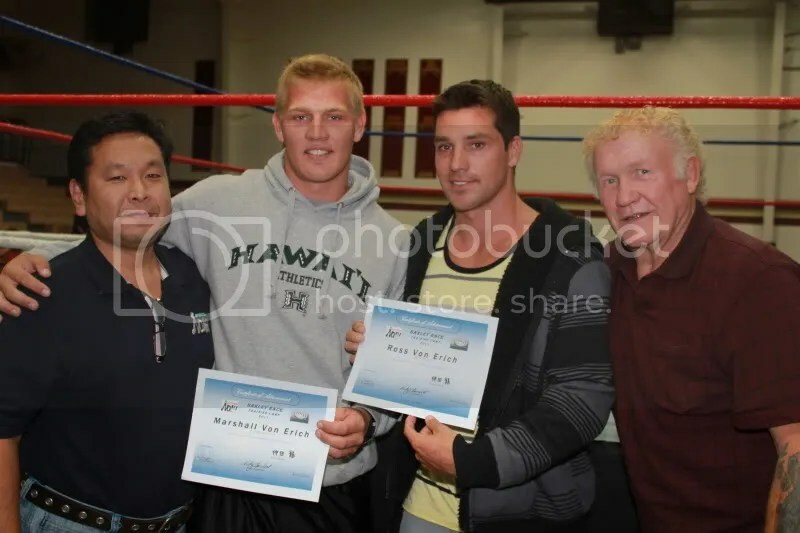 The Pro Wrestling NOAH website reported earlier this year on January 14 that Kevin’s sons Marshall and Ross Von Erich who had participated in the WLW/Pro Wrestling NOAH/WWE camp in the fall, were on their way to Japan to work on their skills at the Pro Wrestling Noah dojo. NOAH GM Ryu Nakata and USA and foreign affairs representative Ken Hirayama visited Kevin Von Erich & his family at their home. Kevin was pleased to meet with Ryu and showed him as his boys Ross & Marshall works out at their gym and teaching those fundamentals of the professional wrestling. Kevin Von Erich and his sons arrived safely at Haneda Int’l Airport. As they announced their participation for NOAH Development program officially at the live coverage atNTV’s building media park along with many fans and other media outlets. Ross & Marshall commented as they are very excited and honored to be able to join the NOAH organization and can’t wait to start training .Kevin commented as he was very pleased to have his 2 sons joining NOAH to start building the basic foundation. Marshall and Ross are both natural athletes as Ross was highly respected as he won several fitness and weight lifting competitions as well as coach’s awards and recognition for his performance throughout high school and college. Marshall excelled at both football and discus, being named to the Kauai Interscholastic Federation All-Star team as a wide receiver and breaking a 12 year old island-wide record in discus. When I met Marshall and Ross, I knew of their athletic background as I was honored to interview their dad who proudly spoke of them. 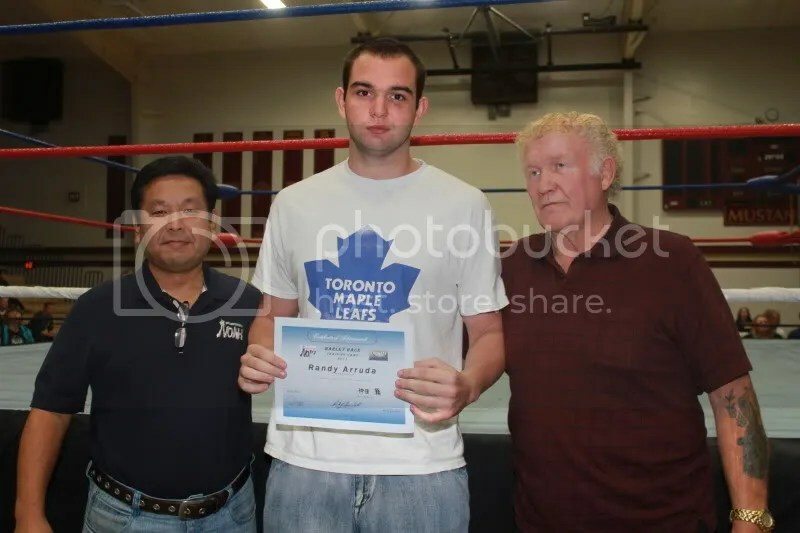 When I saw them they were soft spoken and while I saw them in the ring during the camp I could tell they were timid and shy hitting the ropes. 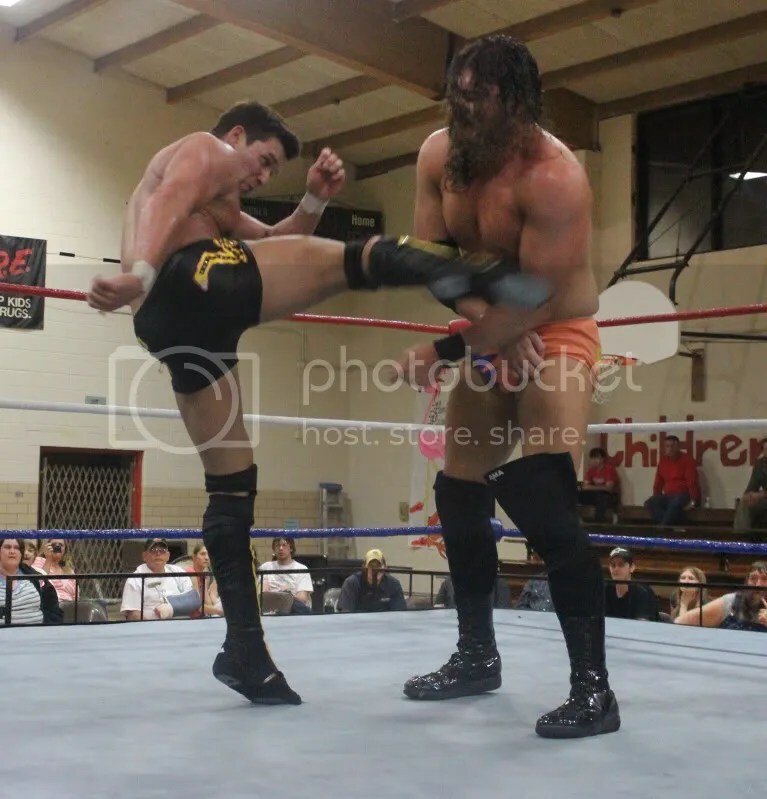 So when I received word from the offices of WLW that Ross and Marshall were to make their wrestling debut in April in the Midwest, I was excited about the opportunity to take photos of the Von Erich’s first matches. To be a man and to be honest with you, I was not expecting much from them as far as ring work as they were so new. Boy was I wrong. Pro Wrestling NOAH in a few months had them in amazing shape and more than ready for their debut. 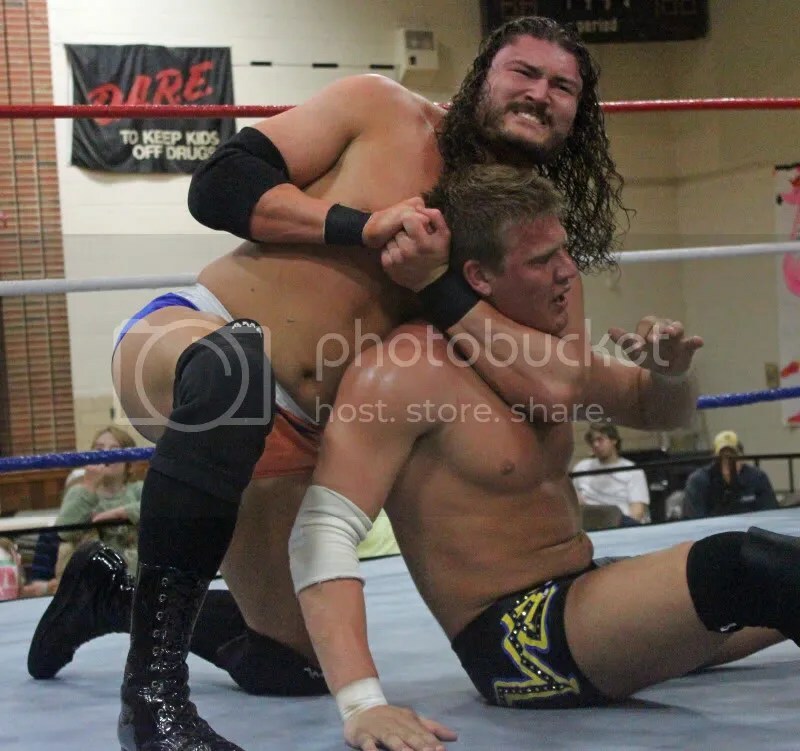 Their first night in Sedan, Kansas they would fall down in defeat against the WLW Champion “The Prince” Jason Jones and the 2011 MWR Future Star recipient Brian Breaker. A great crowd and Pro Wrestling NOAH videotaping the matches for them to be broadcast in Japan there is no doubt that the pressure was on the young boys. 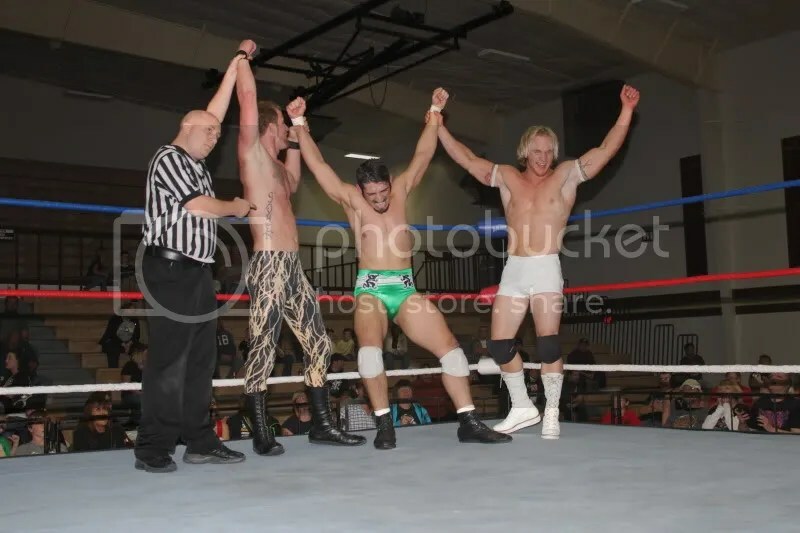 MWR fans may know that Jones and Breaker has been at war with each other for the WLW title but with the newcomers of the Von Erich’s invading their home turf, they seem to have joined together to keep them from winning their first match. With the taste of defeat from two of the finest young wrestlers in the country, Marshall and Ross had to regroup, oh how I would of loved to have been in the car from Sedan, Kansas to Richmond, Missouri while Kevin gave his two sons advice on how to improve their chances to take down the team as good as Jones and Breaker. 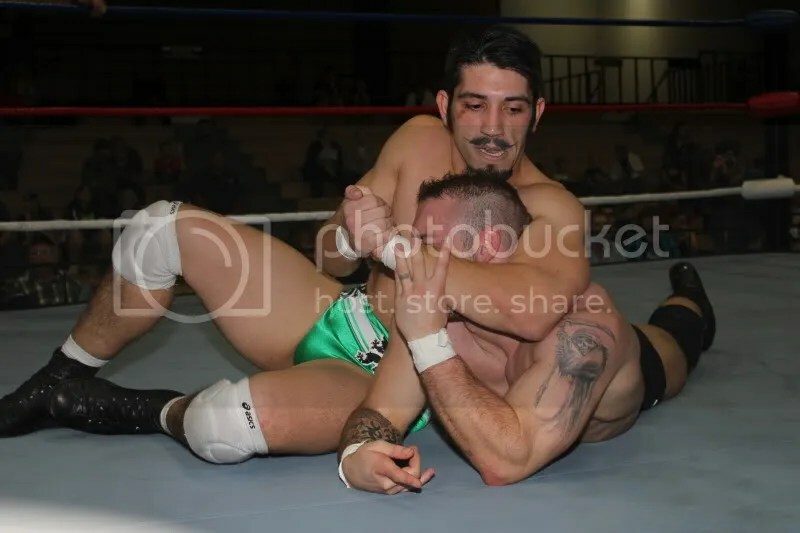 The night in Richmond started out rocky for the youngest Von Erich, Marshall who went one on one against the former WLW Champion and a man who has made his way last year for a tour of Pro Wrestling NOAH Brian Breaker along with former WWE Star Trevor Murdock. 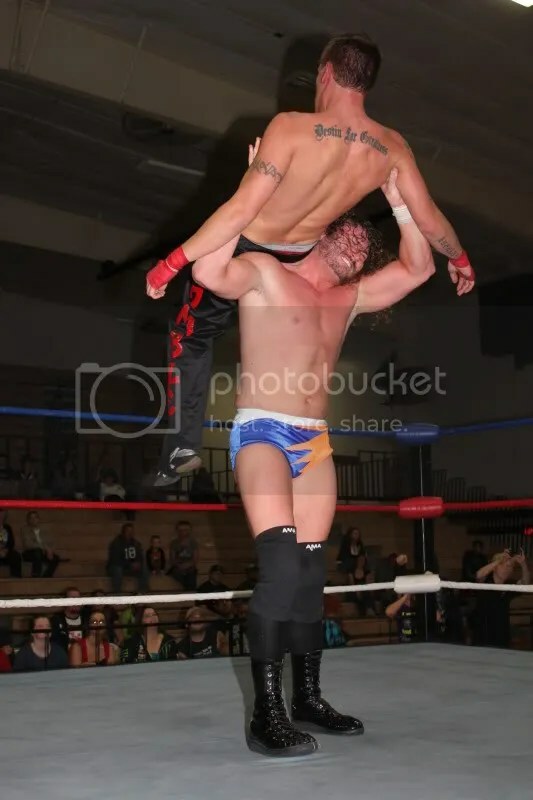 Though Marshall was in phenomenal shape, Breaker still had the edge with his power and size, but the young Von Erich used his speed to have Breaker in trouble. 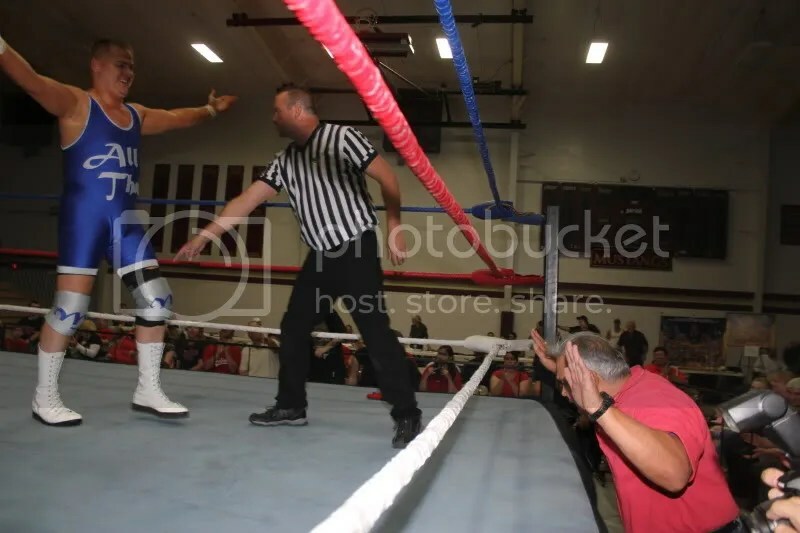 Yet, out from the back came the sneaky snake Jason Jones, who had come to ringside and interfered just long enough to give Breaker the chance to steal the victory. Brian Breaker and Jason Jones 2, the Von Erich brothers zero. The stage was set at that time for as the Von Erich’s challenged Breaker and Jones to a rematch in the main event of the evening. The building seemed too erupted, the action seem to be at a furious pace from the start. Then it happened Marshall locked on the fearsome “Von Erich” Claw on the champ Jones, the fan in me almost shouted in joy as I seemed to have been transported back in 1983 but thankfully, I was able to regain my composure to take photos and remember that I was there in a professional capacity. 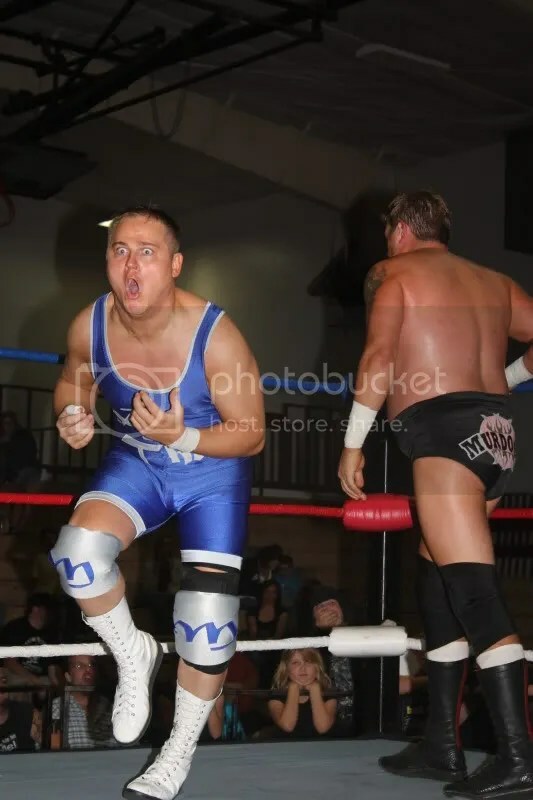 Jones may be evil at times but he can wrestle and by no means is not an idiot did not hesitate to find a way out of the Claw before Marshall had it completely locked in. With the Von Erich’s on fire, Breaker and Jones used their experience and a little cheating to get the edge it was looking bleak for the young Von Erich’s. 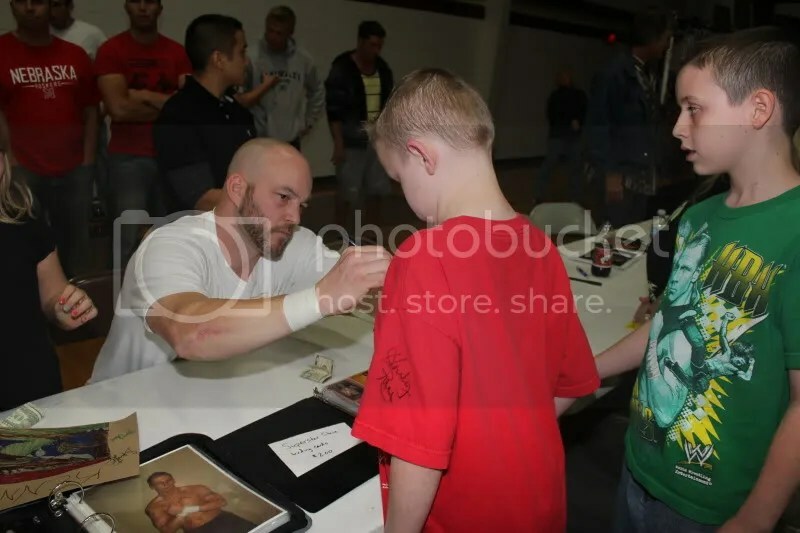 The young fans screamed with all their might to encourage the third generation stars to fight back against the odds and dirty deeds being dished out by Breaker and Jones. 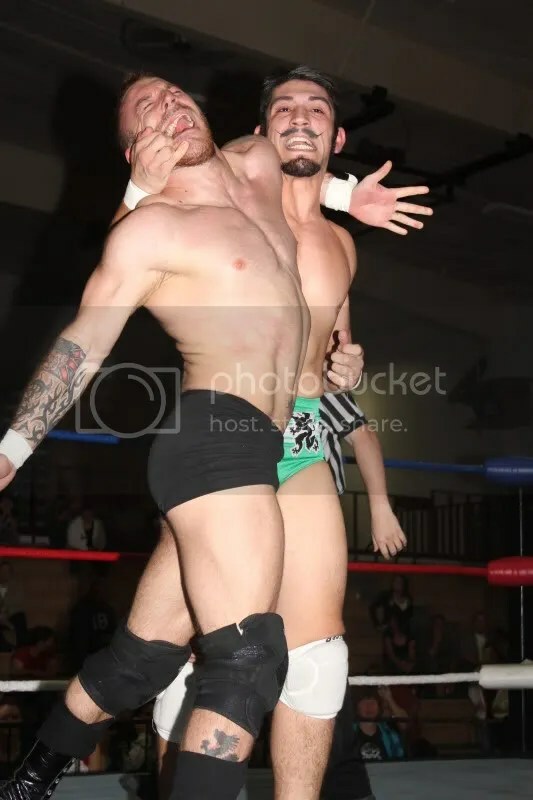 Yet Jones made the save and threw Marshall outside the ring and got the edge on Ross and was prepared for a big move when Marshall was able to get away from Breaker as the two had been going at each other at ringside. Marshall delivered a dropkick on Jones from the back allowing Ross to use the leverage for a roll up as the referee hit the mat 1-2-3. History had been made in Richmond, Missouri!!!!! Pro Wrestling NOAH caught it on tape to take back home to the millions of fans in Japan ,both MWR and Pro Wrestling NOAH were at ringside to photograph the historic moment while HOF Kevin Von Erich and Harley Race watching attentively as Marshall and Ross captured their first win in their career. 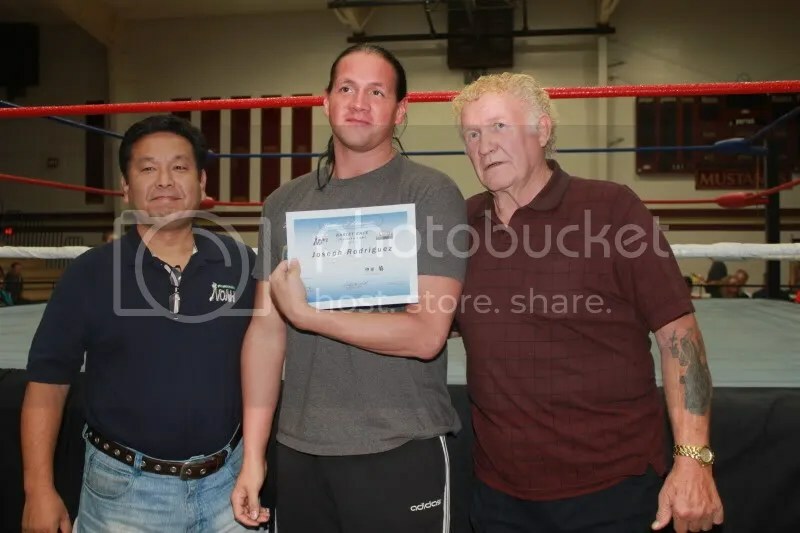 Marshall and Ross will continue their training at Harley Race’s Wrestling Academy for the next few months to go along with their impressive training at NOAH. MWR Fans I urge you to take each and every opportunity to see the Von Erich sons in action while you can in the Midwest. WLW is always worth the price of admission but you will want to say you were there when Von Erich mania began. 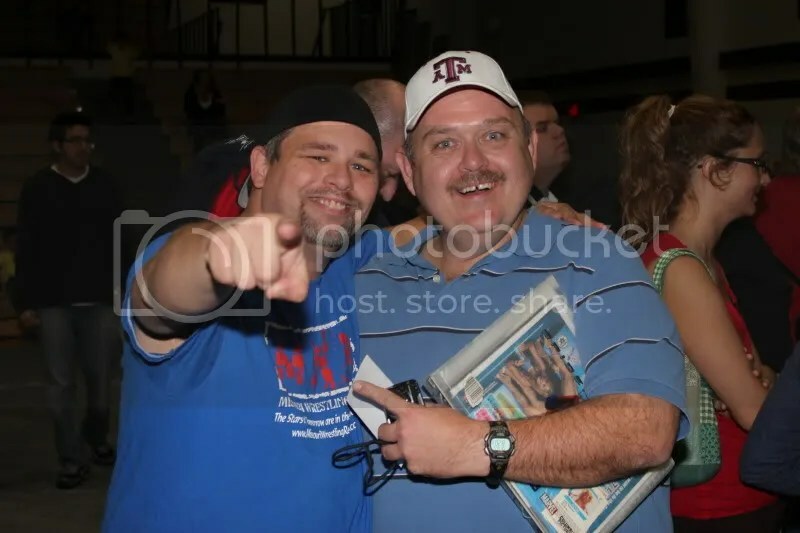 Ross and Marshall along with their dad Kevin will be action this Friday and Saturday night in Warrensburg, Missouri and Eldon, Missouri along with the rest of the stars of WLW, Jones, Breaker, Steve Fender, Ryan Drago, Jeff Strong, Jack Gamble, Stacey O’Brien, the Great Cheyenne, Britton Tucker, Elvis Aliaga plus much more. Remember fans that this Saturday in Eldon, Missouri WLW will be honoring the 8-time NWA World Champion with a special Harley Race Night. For more info on Harley Race’s World League Wrestling click here. For more info on Pro Wrestling NOAH click here. For more info on the Von Erich’s click here. Kevin Von Erich and The Von Erich sons returns to WLW in April!! 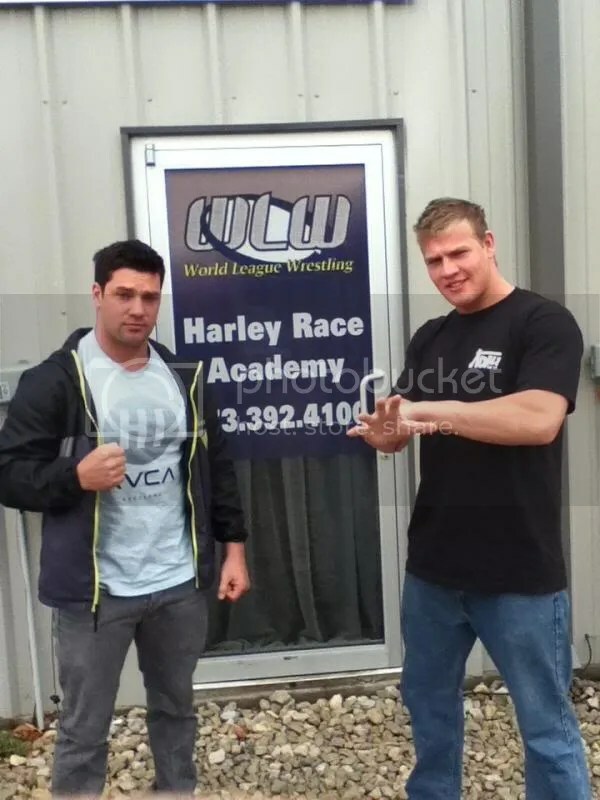 Marshall and Ross Von Erich have arrived at The Harley Race Academy from Pro Wrestling NOAH to continue training and preparing for the WLW shows in April. Attention all wrestling fans! World League Wrestling (WLW) is starting it’s SUPERBASH TOUR 2012 starting Friday April 20th. The location for the kickoff show is Sedan, KS at the Sedan Jr. High School Gymnasium. A portion of the proceeds goes to help the “Save The Gregg Theater” group based in the town of Sedan. he following night takes place in Richmond, MO on April 21st (Saturday) at the Richmond Community Center. Again, a portion of the proceeds goes towards the Richmond Parks & Recreation Department as well as the 2012 Boosters Club! The tour picks back up on April 27th when World League Wrestling debuts in Warrensburg, MO on Friday, April 27th! The event takes place at the Lovinger Gymnasium located on the Central Missouri University campus. There is plenty of parking for this event and proceeds go towards the Johnson County Cares group in Warrensburg, MO. 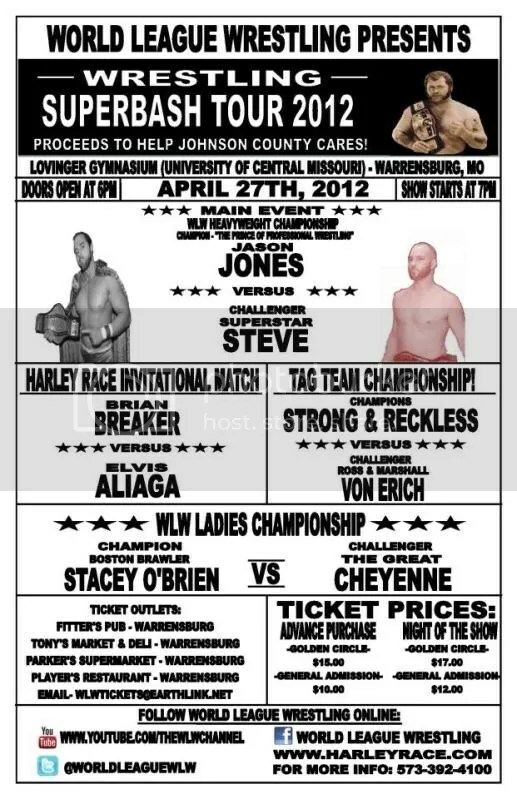 The next scheduled show of this tour takes place on April 28th in the hometown of World League Wrestling – Eldon, MO. The site of this event will be at the Eldon Community Center. Proceeds from this event will be given to the local Dogwood Hill State School PTO. This night will be very special and World League Wrestling and its mass of fans pay homage to the 8-time NWA World’s Heavyweight Champion, “Handsome” Harley Race. So come and be a part of this special night in Eldon, Missouri! These shows will feature the long-awaited professional debut of 3rd generation wrestlers – Ross and Marshall Von Erich – sons of WCCW superstar and professional wrestling legend, Kevin Von Erich. 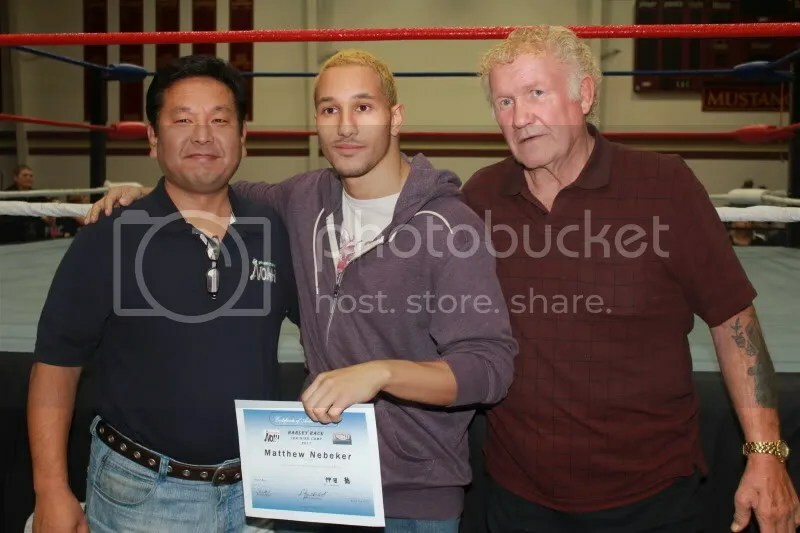 Both sons arrived ready and eager to learn at the Harley Race Wrestling Academy on Wednesday, April 11th. Previously, they were training in the school system of Pro-Wrestling NOAH based in Tokyo, Japan. Pro-Wrestling NOAH is the sister company of WLW. They have been groomed by one of the best wrestling companies on the planet and look forward to debuting what they have learned exclusively for Harley Race’s WLW. The debut match on April 20th will feature the Von Erichs versus Brian Breaker and current WLW Heavyweight Champion “The Prince of Professional Wrestling” Jason Jones. To make the Von Erich’s debut even more extraordinary, their father – Kevin Von Erich – will be ringside to lend his support at ALL matches (April 20th, 21st, 27th, and 28th)! Also taking place throughout the Superbash Tour ’12 is the 2nd annual Harley Race Invitational Tournament. 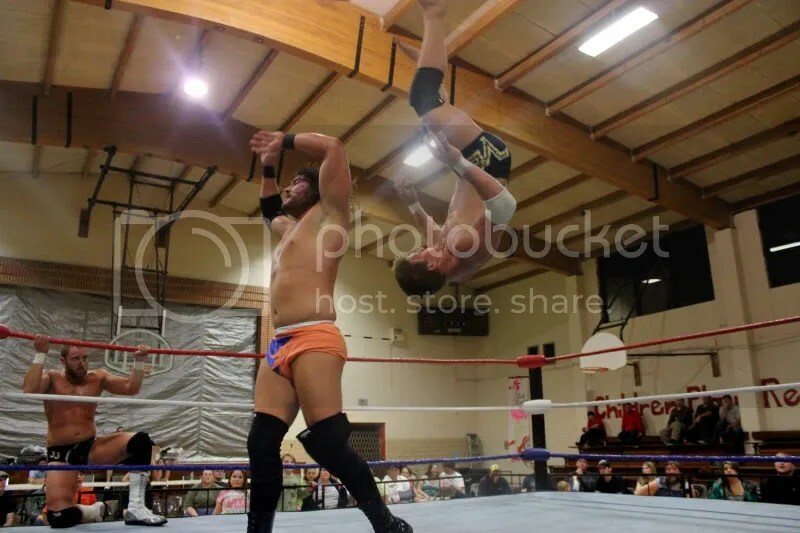 Participants are Brian Breaker (MWR Breakout Superstar of 2011 and former WLW Heavyweight Champion), Superstar Steve, “The Gentleman’s Bruiser” Ryan Drago, Elvis Aliaga, “O.T.T.” Britton Tucker, Dave Vaughn, Jeff Strong, and Jack Gamble. 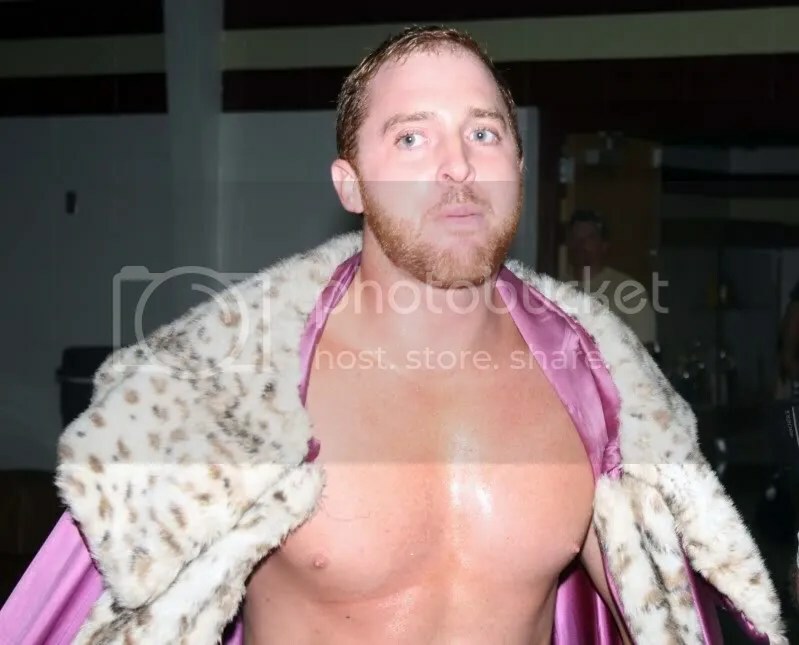 Last year’s tournament saw the crowning of the “Prince of Professional Wrestling” Jason Jones by his defeat of Ryan Drago. Since then, Jones has went on to claim the WLW Heavyweight Championship and has been on fire ever since. Another added bonus is the addition of the Ladies Championship defense by WLW Ladies Champion Stacey O’Brien. Her matches will be in defense against WLW newcomer The Great Cheyenne. The Boston Brawler’s skills will be put to the test as The Great Cheyenne wants to make a name for herself at O’Brien’s expense. World League Wrestling is picking up steam and quickly becoming the organization in which MANY up and coming, as well as established, professional wrestling superstars want to be a part of. Shows are becoming more popular and tickets are selling very quickly! If you wish to reserve your tickets early and guarantee your place at the event, please visit http://www.harleyrace.com for ticket outlet information for each show. If you are unable to go to a ticket outlet at for anyone or multiple events, you are now able to reserve tickets online by emailing wlwtickets@earthlink.net. This can be used to reserve tickets to any one of the shows upcoming for World League Wrestling. World League Wrestling is owned and operated by 8-Time NWA World’s Heavyweight Champion Harley Race. Founded in 1999, WLW has been regarded as one of the most recognized independent promotions around the world. Many of today’s top wrestling superstars has made their way to wrestling superstardom via the Harley Race Wrestling Academy (training grounds for World League Wrestling). Stars include Trevor Murdock, Ted Dibiase Jr., Michael McGuillicutty, WWE referees John Cone and Ryan Tran, and several of our roster has made trips to Japan to wrestle for WLW’s sister promotion (Pro-Wrestling NOAH based in Tokyo, Japan). 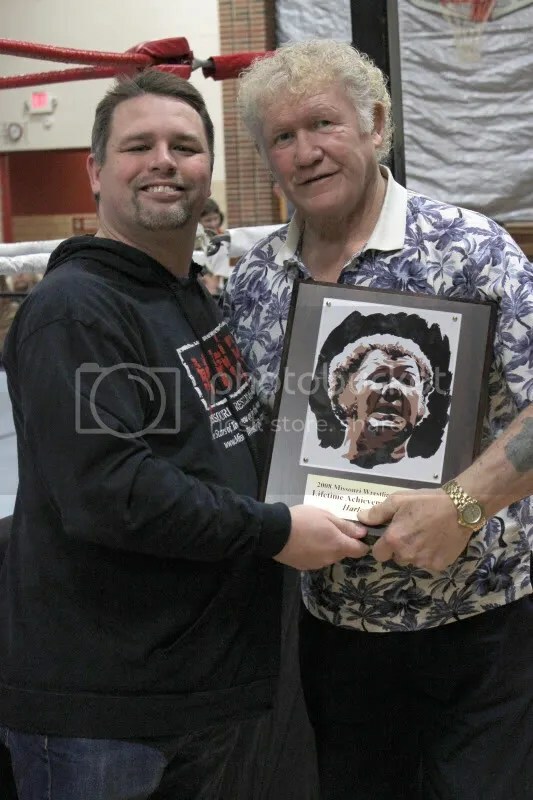 Harley Race presented with his MWR Lifetime Achievement award plaque with art from Rob Schamberger in Richmond Missouri. Missouri Wrestling Revival first awards were given for 2008, as we looked to honor the men and women of the Midwest. To bring them exposure to the west and east coast as well as the fans of the Midwest. The award for MWR Lifetime Achievement Award was a no-brainer as it would be the former 8-time NWA World Champion Harley Race. Race has traveled around the world bringing respectability to the sport of wrestling since his debut in 1960. While he won World titles, entertained fans as “King” Harley Race during the boom years of the 80’s at WWF (E) his biggest contributions could very well be outside of the ring. 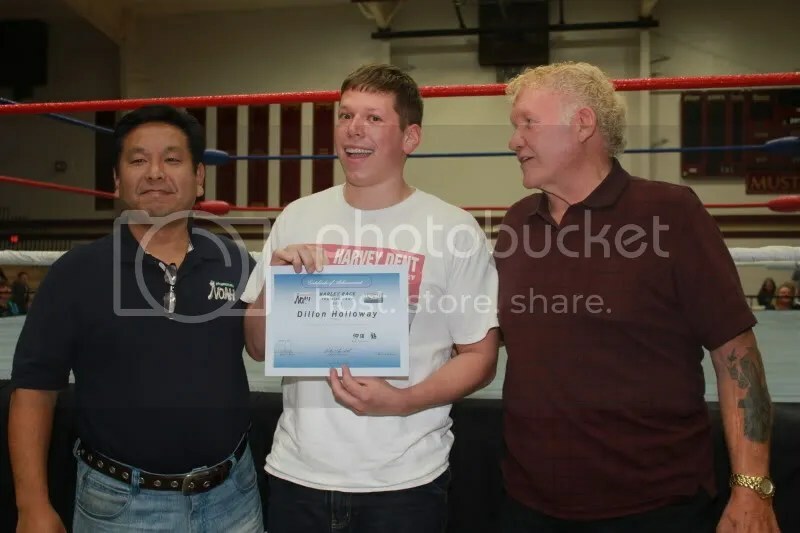 Race currently owns the wrestling school the Harley Race Academy as well as the wrestling promotion World League Wrestling. 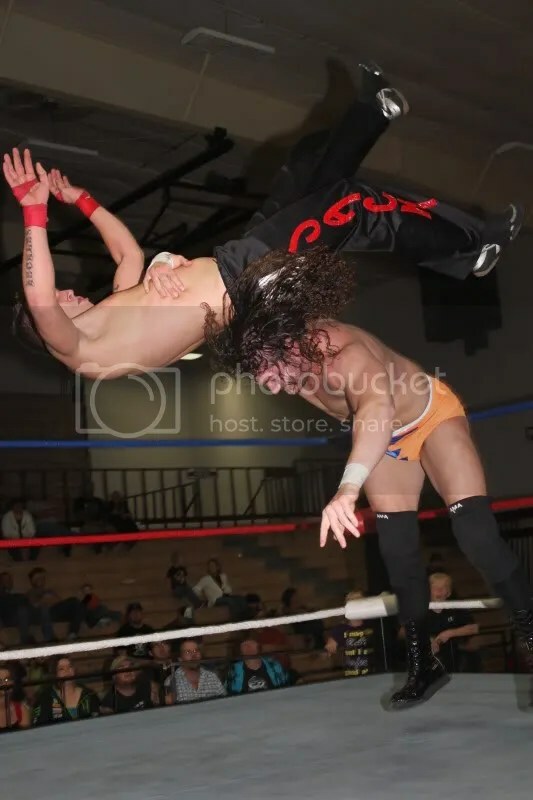 The school provides the proper training to be a pro wrestler and have produced stand out wrestlers such as Trevor Murdock, Matt Murphy, Wade Chism, Bull Schmitt, Joe Hennig, Keith Walker and current WWE Ref John Cone. 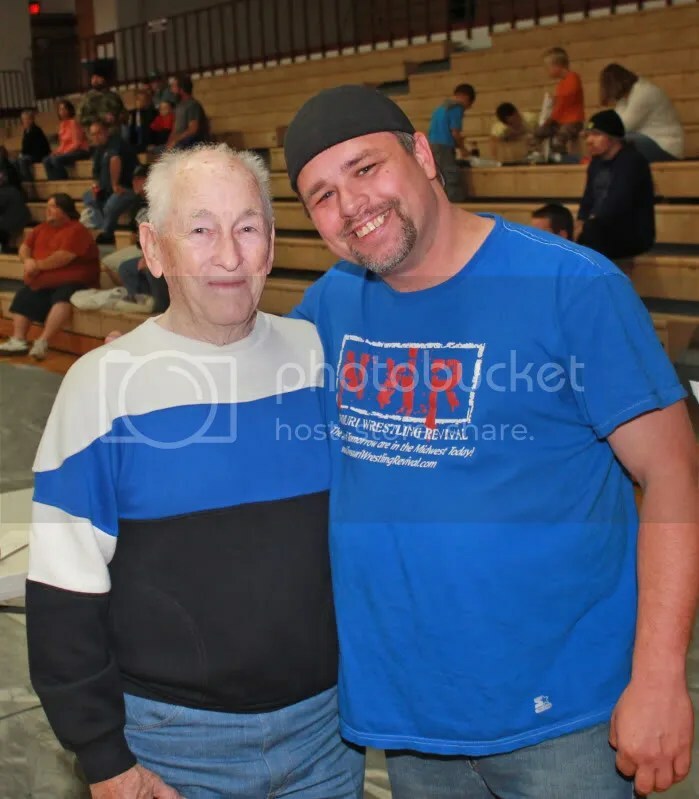 Just as important as the school for the aspiring wrestlers, WLW for over ten plus years has been able to raised over 250,000 thousand dollars for the families, communities and schools around the Midwest with wrestling fundraising shows. 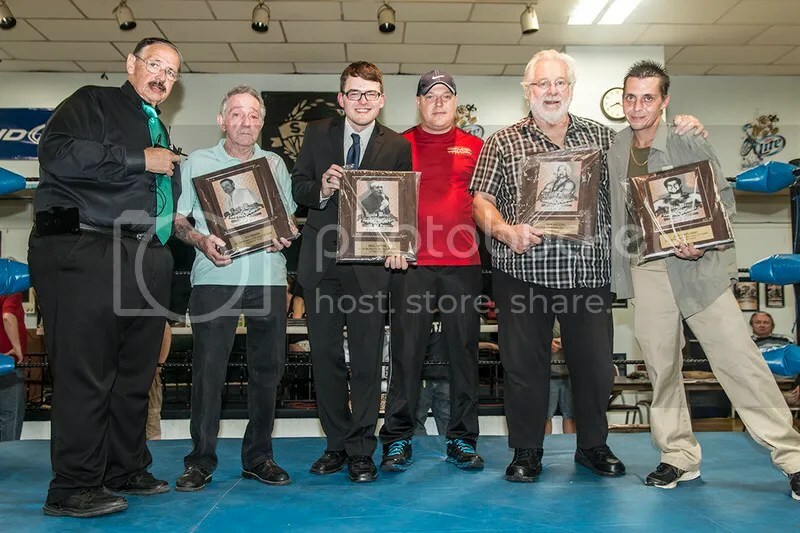 He is a member of every prestigious and worthy Wrestling Hall of fame around the World and it was with great pleasure that we were to present Harley Race with a worthy MWR Lifetime Achievement plaque with a great illustration of the one of the worlds greatest wrestlers of all-time from artist Rob Schamberger. Today’s WLW is filled with a great roster from the WLW Champ Jason Jones, Brian Breaker, Ryan Drago, Jeff Strong, Jack Gamble, Mark Sterling, Steve Fender ,Dustin Bozworth, Stacey O’Brien, Miss Natural just to name a few. So when you see wrestling poster in your hometown and it has WLW on it, know that your money will be well spent and go to a good cause. 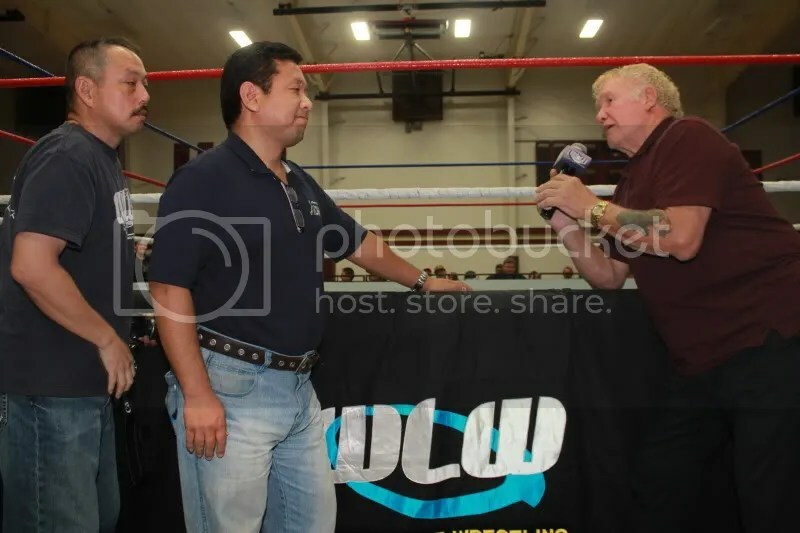 Fans this month can catch WLW four times as the Second annual Harley Race invitational tournament will be decided. 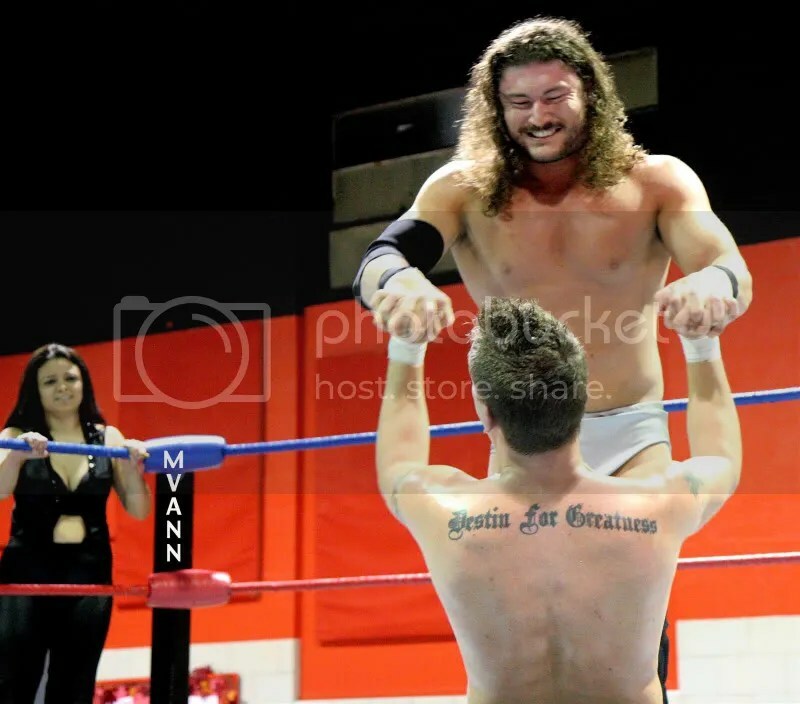 Last years ,winner “The Prince” Jason Jones propelled that momentum towards capturing the WLW Championship. 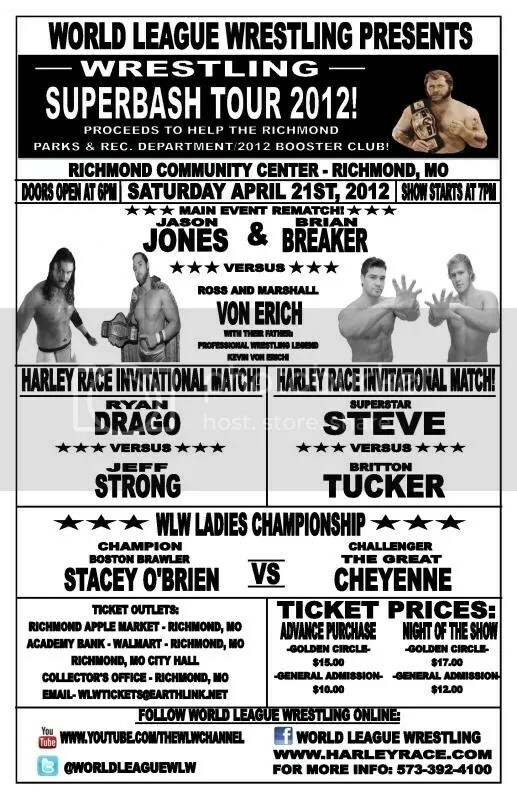 This month Kevin Von Erich returns to WLW , while his sons will have their very first match EVER!! April 20th – Brian Breaker/WLW Champion “The Prince” Jason Jones vs. Ross/Marshall Von Erich (with Kevin Von Erich ringside), WLW Tag Team Champions will make title defense, “The Well Mustacheod Gotch Stylist” Ryan Drago will have singles competition, WLW Ladies Championship will be defended as Stacey O’Brien faces The Great Cheyenne. More TBA. April 27th – More Harley Race Invitational Tournament semi-qualifying matches will take place as Brian Breaker aims to secure a spot in the finals of the tournament. WLW Champion “The Prince” will have a championship title defense, and WLW Ladies Champion will defend her title (assuming the championship doesn’t change hand before this night), and the Von Erich brothers will be in action against WLW tag team champions Strong & Reckless! April 28th – The finals of the Harley Race Invitational Tournament take place this night with the participants to be decided upon by previous matches, the Von Erich Brothers will be in action, WLW Ladies Champion will be defending her WLW ladies championship, and WLW Heavyweight Champion “The Prince” Jason Jones puts his title on the line. Again, more superstars will be announced in the coming weeks and there WILL be more announced. 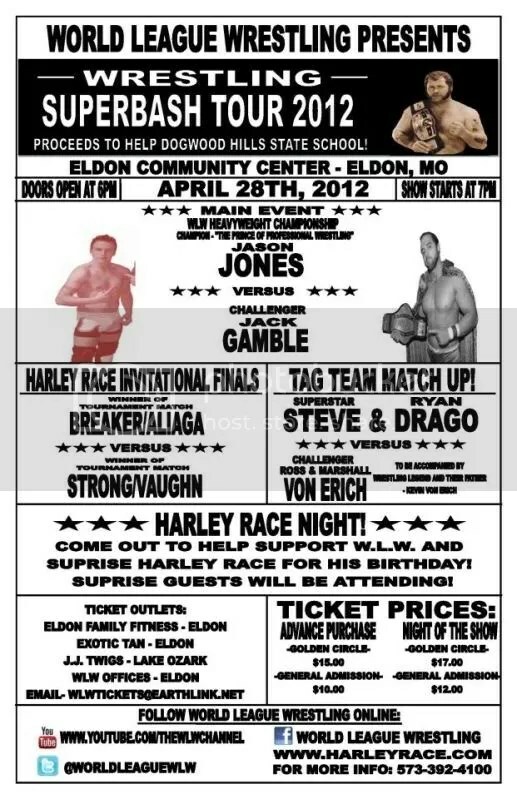 The HUGE event in Eldon will also be the “Harley Race Appreciation Night” so many fans will be in attendance! Get your tickets reserved now at wlwtickets@earthlink.net! 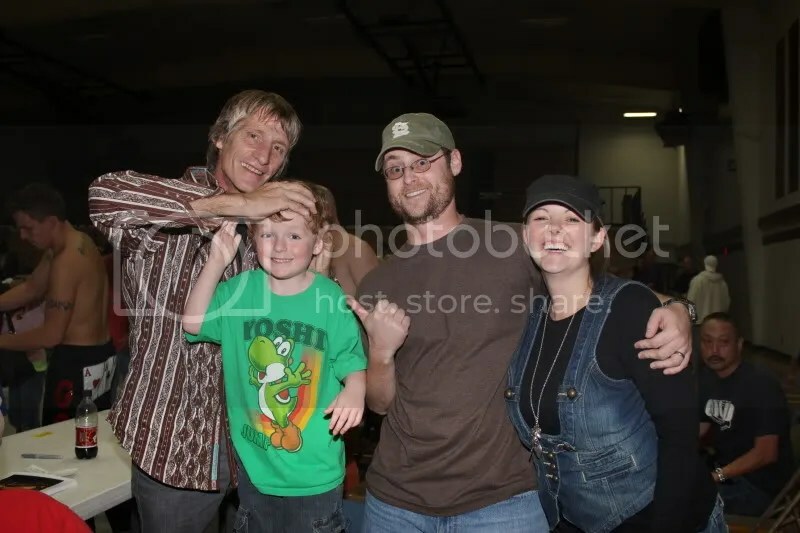 Kevin Von Erich and his sons Ross and Marshall returns to WLW on April 20th-21st!!!! Editors note: Kevin is scheduled to be at the Fort Gibson ,Oklahoma show and is (believed) to be at the Warrensburg show as well. 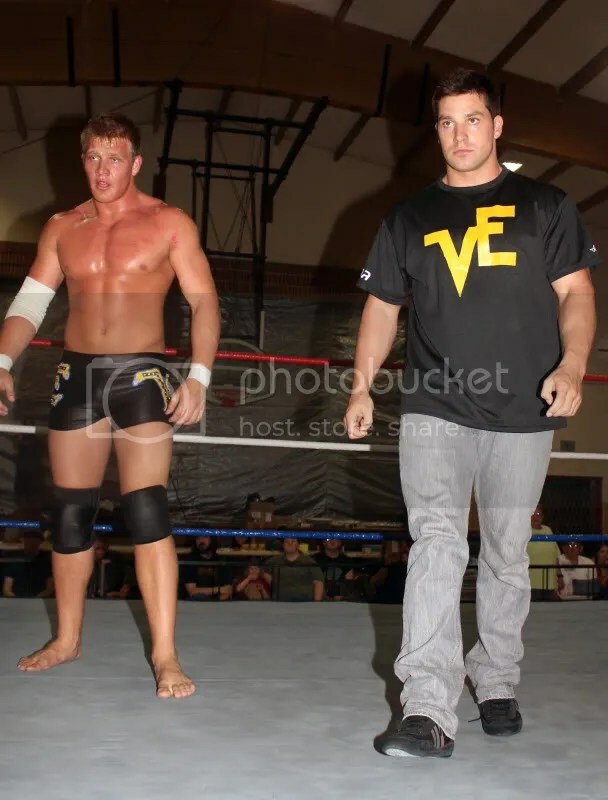 Still MWR fans I highly encourage you to make that show as Von Erich’s sons will be in action. Sorry about the confusion on my end. 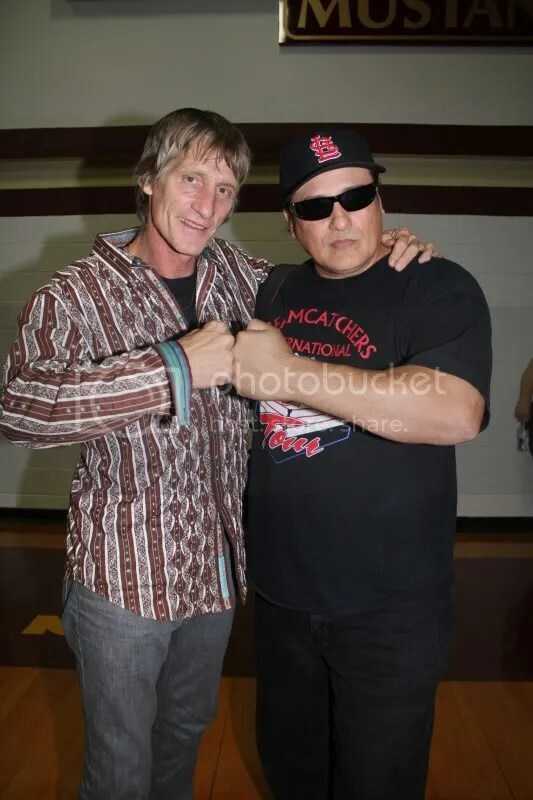 World League Wrestling is proud to announce that the son’s of the legendary World Class Championship Wrestling superstar Kevin Von Erich will be making their debut on April 20th, 2012. The location of this event is in Ft. Gibson, Oklahoma at the Fort Gibson High School Gymnasium in conjunction with Cystic Fibrosis Solutions. World League Wrestling is owned and operated by 8-Time NWA World’s Heavyweight Champion Harley Race. 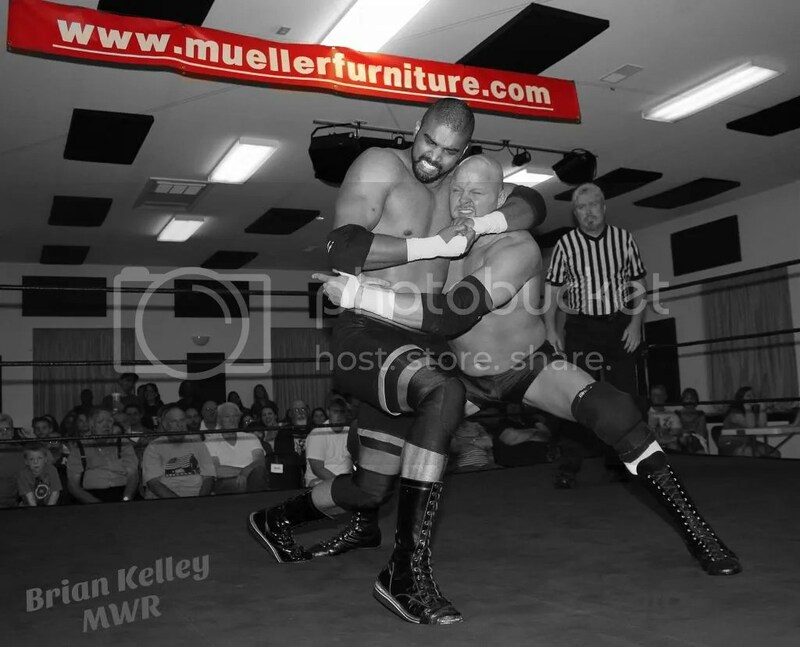 Started in 1999, WLW provides the best wrestling throughout the Midwest year-round. Wrestlers that come through this company have stated that World League is one of the best companies in the world. 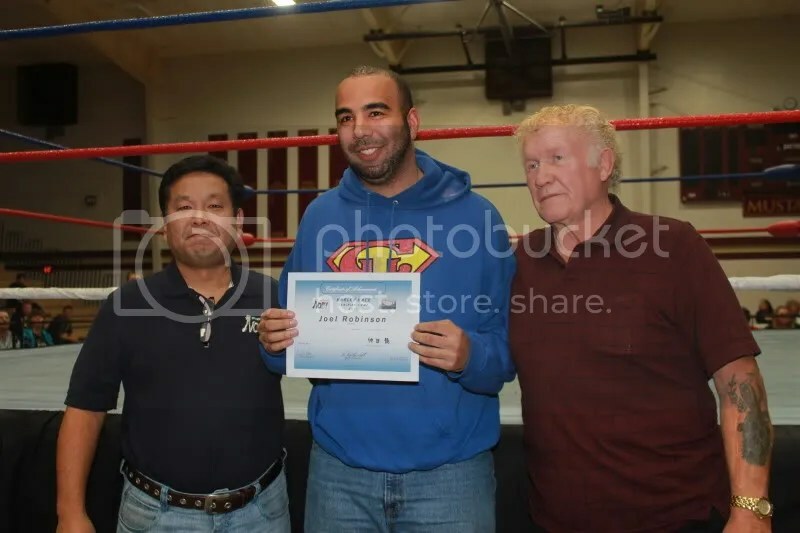 Alongside WLW, Race also operates the Harley Race Wrestling Academy. Training some of the best wrestlers in the world, the wrestling school also operates year-round. 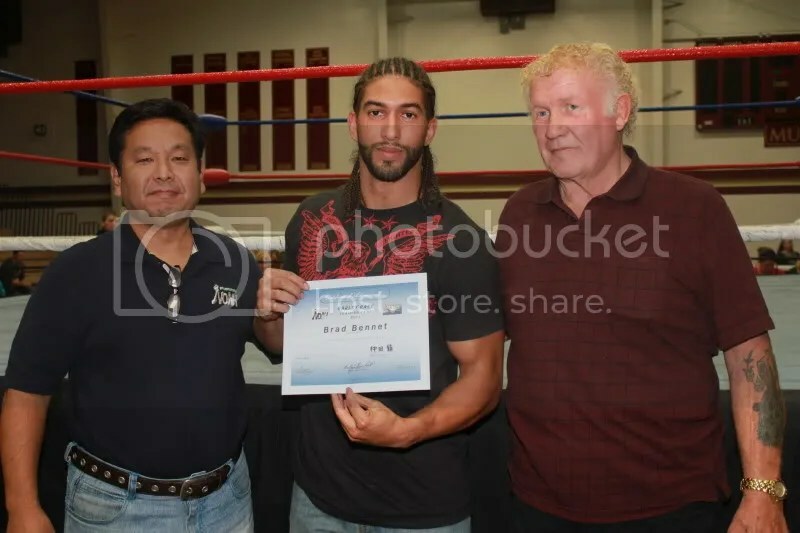 Some of its notable students include Trevor Murdock, John Cone, Joe Hennig, Ted DiBiase Jr., and Richie Steamboat. 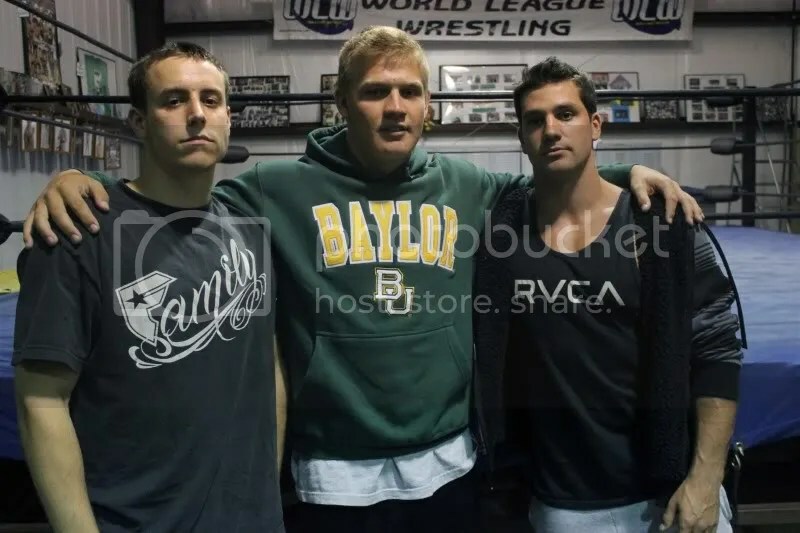 Now, another group of third generation wrestlers are coming to take WLW by storm and they are Ross and Marshall Von Erich, sons of professional wrestling legend Kevin Von Erich. 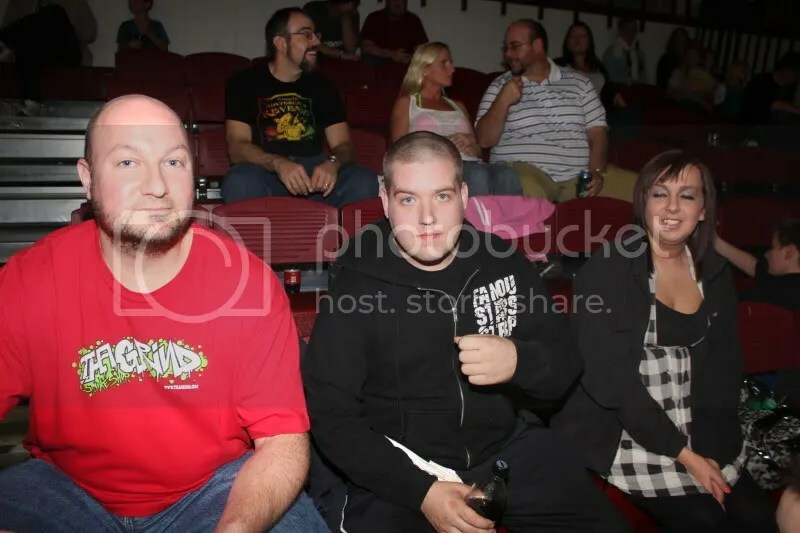 In October of 2011, Ross and Marshall came to Eldon, MO to train under Harley’s academy during its annual week long wrestling camp. While there, they were scouted by Pro-Wrestling NOAH representatives (WLW’s sister company in Japan) and were invited to continue their wrestling training in Tokyo, Japan. In January of 2012, they left for Japan and are currently still there. In April of 2012, Ross and Marshall Von Erich will return to the United States and World League Wrestling. 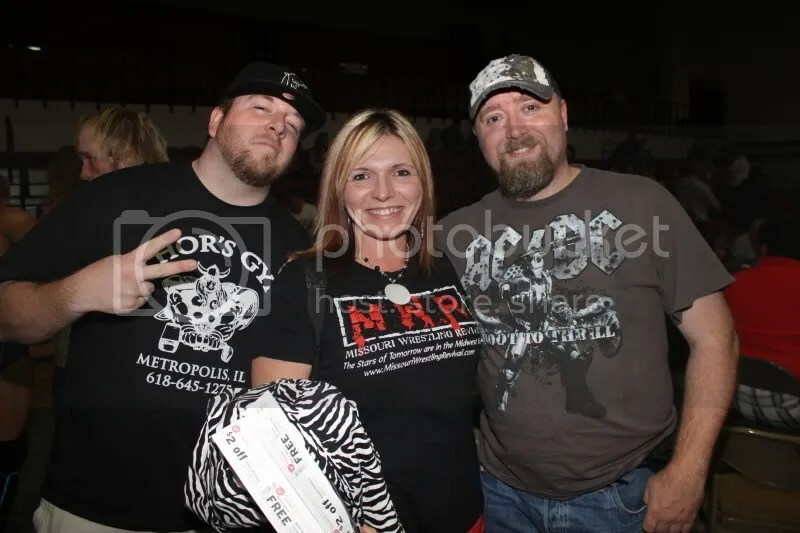 Their professional debut will be on April 20th, 2012 in Ft. Gibson, Oklahoma and will continue the next night in Warrensburg, Missouri. They are only going to be here until mid to late June of 2012 as they are set to return to Japan for Pro-Wrestling NOAH shortly thereafter. 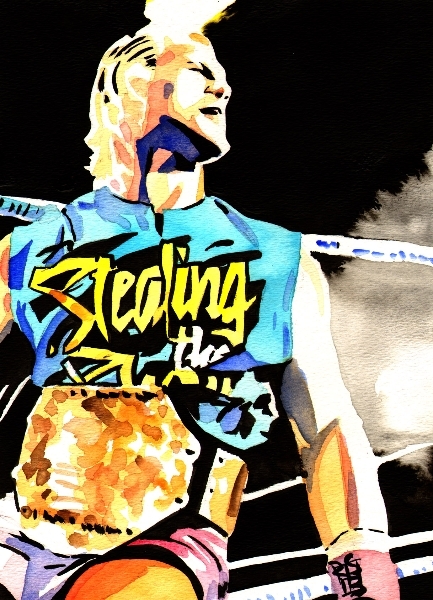 MWR exclusive interview with WWE Hall of Famer Kevin Von Erich. The packed house at WLW –Pro Wrestling Noah show had the opportunity to speak to Kevin Von Erich, sign autographs, share memoires of the Von Erich greatest moments and have their picture taken with the man many of the them grew up as kids cheering on as they took on the Freebirds, Iceman Parsons, Chris Adams, "Gorgeous" Jimmy Garvin and members of Skandor Akbar's Devastation Inc. 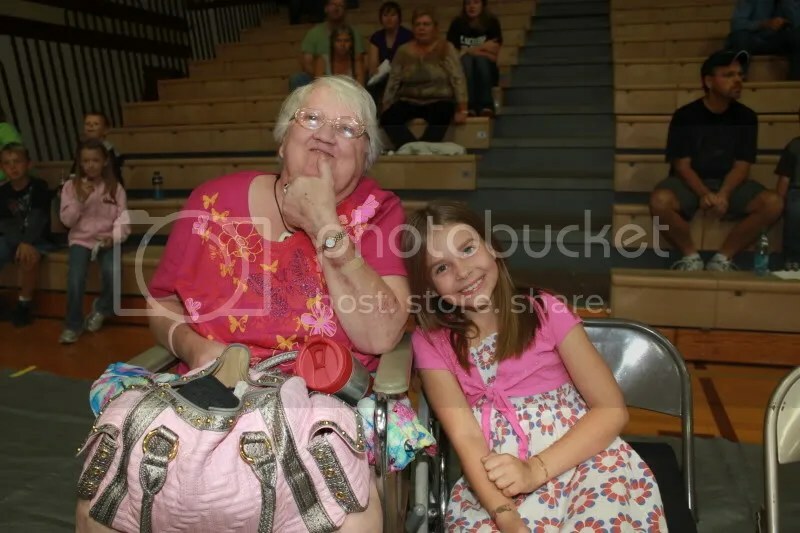 This young lady waited for her turn to speak to Von Erich was an example how happy fans were about him being at the show. Missouri Wrestling Revival was honored to be a guest of WLW during their annual WLW WWE Pro Wrestling Noah camp recently. A great week filled for the young stars of pro wrestling to learn from the very best. For a full recap from MWR called WLW/WWE/Pro Wrestling Noah presented a magical week for wrestlers and fans in the Midwest in October. During the camp I was fortunate able to interview Kevin Von Erich. The Von Erich name is filled with triumph and tragedy throughout the years. Loved not only in their home state of Texas, their talents and charisma would be a huge catalyst for the wrestling boom in the 80’s. During the time we spoke, you could tell that today he is happy surrounded by many that love him including his children. 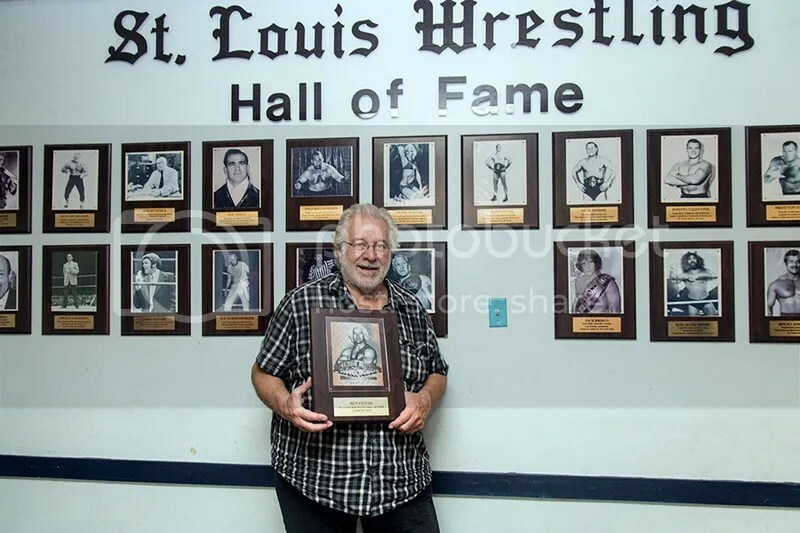 I hope you enjoy this interview that was filmed at Harley Race’s World League Wrestling training facility in Eldon Missouri.